The calendar tells us it is spring, but the reality is that the coldness and barrenness of winter still has its grip on us. I awoke yesterday morning to snows swirling in the air… a flurry of winter still hanging on to the grips of a past season where frigidity is present and the warmth of new life seems absent.This morning is a new day. It’s one which we don’t define by the weather, but one… which dawns and opens up with new possibilities, new hopes, new dreams and new life. It’s not just about the new life to come, but about the new life given to us to grab ahold of right now. 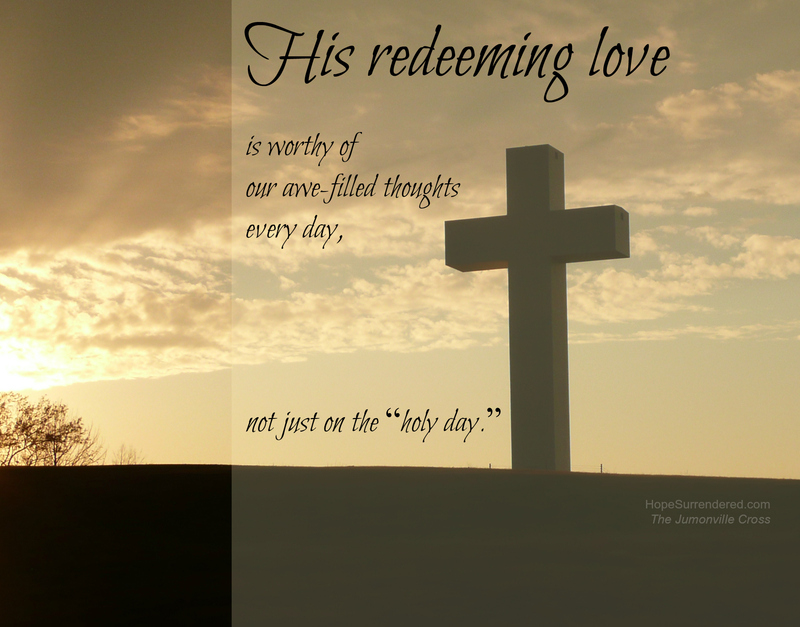 His love… His redeeming love is worthy of our awe! Put the emptiness, the barrenness, and the coldness of the past aside, for no matter what our circumstances may be, a new life is waiting for each of us in Christ. Today is the day to embrace how He desires each of us to be made new in Him. Happy Resurrection Sunday! We miss you, Terry! Praying for you often, and hoping your health has been regained and renewed!